A modern extension that complements a traditional farmhouse. Located in Bad Leonfelden, Austria, this property showcases the area’s classic style as well as a fine example of contemporary architecture. 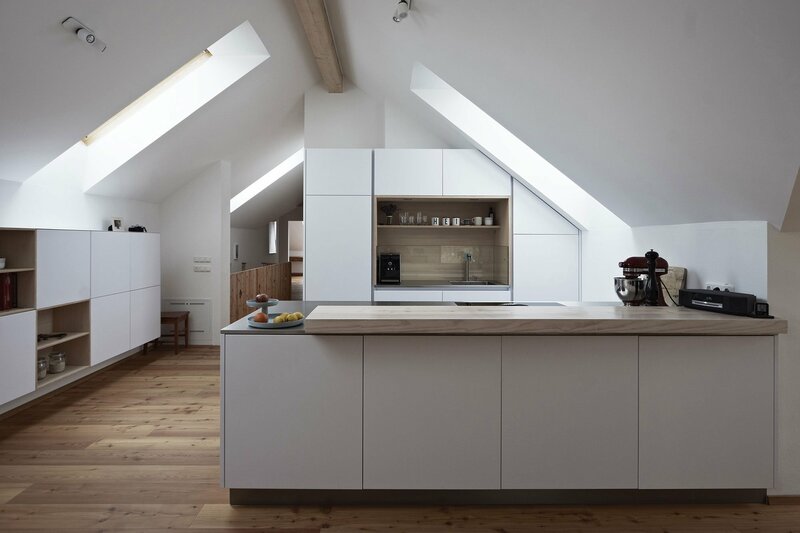 The owners hired Hammerschmid Pachl Seebacher Architekten (HPSA) to preserve the old section of the traditional farmhouse and to also build a modern extension. House MK features a blend of two eras. On one side, the original dwelling boasts white granite walls and a clipped gable roof, both typical of vernacular architecture. On the other, the extension features a modern aesthetic, geometric elements, and an L-shaped volume. While distinctly modern, the extension draws inspiration from local barns and outbuildings. To integrate the new volume into its context, the architects used locally sourced spruce from the nearby forest as well as asymmetrical volumes that follow the height of the original building. The interior brings together modern simplicity and rustic accents. Minimalist furniture and understated accessories complement the exposed beams and wooden flooring. Large windows and skylights bring natural light inside the extension, while white walls enhance the brightness further. Photographs© Dietmar Hammerschmid.